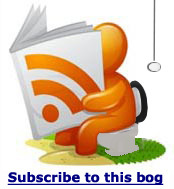 If your going to France this year you might consider taking a look at the Contentin. The contentin is situated in lower Normandy, France. And if your geography is as bad as mine I can tell you it's on the north coast next to Brittany that sticks up like a finger, pointing towards England. Most United kingdom summer visitors go to the contentin via Cherbourg (Brittany ferries) and drive quickly through Normandy to the South of France. This is a loss because this part of Normandy is a well kept secret. The Cotentin is the largest part of the Manche Department in Lower Normandy. There are miles of beautiful beaches, rocky coves and dramatic landscape. There is an air of the mysterious where one gets the sense of having gone back in time. Think Cornwall with better weather, more tropical plants and certainly fewer visitors and you get an idea of the style of the Cotentin. Magical, laid back peaceful and slightly weird. The one time homes of the painters Jean-François Millet and Paul Signac the coast is a significant beauty. The North has miles of walk able coastline all the way to the east where it takes you to the Northern D day beaches. 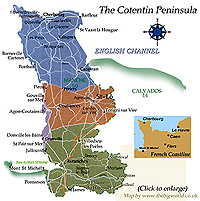 Find out more about the cotentin peninsula in more detail here.